The pillbugs in my garden are completely out of control. There have to be millions of them. I tried the beer trick, but there are just way too many of them. I accidentally tried duct tape, which captured a few hundred, but didn’t put a dent in the population. I questioned whether it was the straw mulch, but determined that wasn’t the issue. I tried leaving the soil exposed for a few weeks to see if they would leave on their own, nope. The issue with the pillbugs is that they chowdown on young seedlings as well as eating bean seedlings before they can even come up from the ground. I finally went to the Natural Gardener, since my home remedies have failed miserably. They recommended Sluggo. I’m giving it a try and will post on my results. >Pillbugs are crustaceans so they need a lot of moisture. 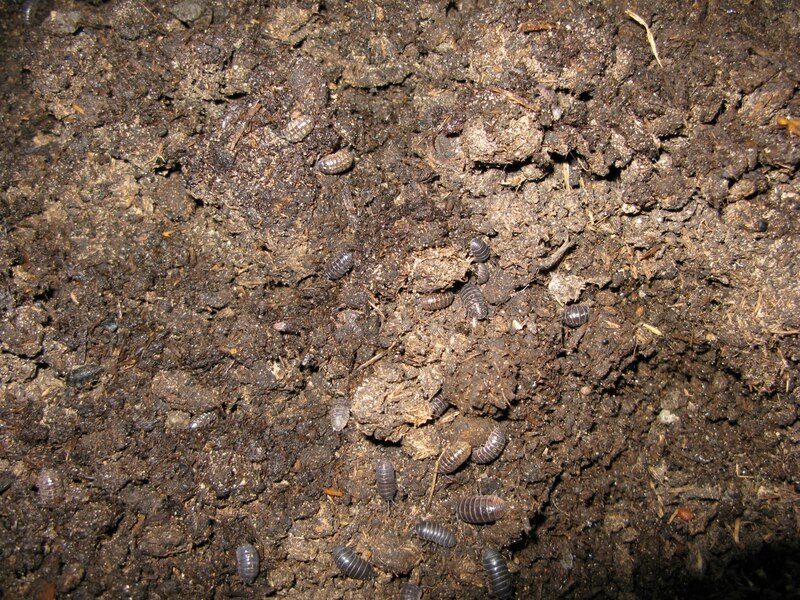 Until the moisture dries up a bit, you'll continue to have problems with pillbugs. Try turning your mulch layer to help it dry. >I suggest continue using tape alongside Sluggo PLUS and beer traps. Infestations of this magnitude need a full-blast attack with several weapons. Be aggressive! >Oh, bummer! I really though rolly-pollies (as I grew up calling them) were good for the garden. They are apart of the decomp program in nature, and figured they were like earthworms. I guess that makes sense, though, them eating the seedlings.Pill bugs like shade and wet, so even just pulling back straw/mulch to let the sun in around the seedlings will help a lot. And birds love to eat pill bugs (they can get a parasite that makes them run out into the sunny parts and makes it easier for birds to eat them, which is part of the parasite's life cycle). >I had good luck last year setting watermelon rind traps for them. http://bit.ly/a58sBv But I had thousands, not millions. >Let me know how the sluggo works. I also have a pillbug problem in one of my beds right now. So far I've been able to keep it under control by letting them eat up the marigolds.I want to try the grapefruit trap thingy, but I have to wait until the weekend so I can have time to check on things. >Thanks for the tips everyone! I think I will try a little of everything at the same time to see if I can do some serious damage. Like Caroline's garden, I believe mine started from the squash plants. I first noticed them last year when the squash was pretty overgrown, and rotting a bit due to the squash vine borers. I think the numbers have been slowly growing over the winter. I believe they took out all of my butter beans, so time to fight back.